ISRAELI PRIME MINISTER BENJAMIN NETANYAHU’S arrival in Washington shortly after President Barack Obama’s victory on healthcare reform had both symbolic significance and practical implications for the Likud leader. 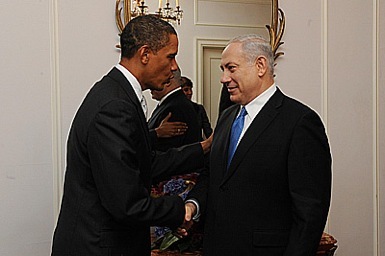 Obama’s win was interpreted as Netanyahu’s loss, reflecting the zero-sum nature of the diplomatic clash between the rightwing Israeli leader and the liberal occupant of the White House. That “Bibi” arrived in Washington just in time to witness the aftermath of a historic political confrontation over the course of U.S. domestic policy was no coincidence. An obsessive consumer of Washington news and gossip—much of it filtered to him through the lens of rightwing media and phone conversations with the likes of Bill Kristol and Charles Krauthammer—Netanyahu likely thought he was going to meet with the U.S. president just as the Age of Obama was coming to an end. During the weeks and months preceding Netanyahu’s visit, Republicans and Tea Partiers had vigorously promoted a wildly inflated political narrative, according to which Obama’s domestic agenda—including on healthcare—exposed the president’s dictatorial tendencies and radical ideology. Netanyahu’s arrival injected a foreign policy component into this storyline. Not just a socialist at home, Obama was also a serial appeaser of terrorists and rogue regimes, the most anti-Israeli and pro-Arab figure to ever occupy the White House. Watching Bibi massaging his political message to Americans—including at a meeting of evangelical pastor John Hagee’s Christian’s United for Isreal in Jerusalem on the eve of Vice President Joe Biden’s fateful visit to Israel in early March—it seemed as though the prime minister was running for office in the U.S. Congress, as the distinguished representative from the state of Israel. His neocon interlocutors in the United States may have even nurtured this impulse. In the end, however, Netanyahu was not only forced to confront the U.S. president on severely weakened terms, he also confirmed his allegiance to a defeated U.S. political club that proved incapable of providing him realistic guidance. THE POLITICAL AND IDEOLOGICAL LOVE AFFAIR between Netanyahu and the neocons goes back to the Reagan presidency and the final years of the Cold War, when Bibi served as Israel’s representative to the United Nations and then as ambassador to the United States. Members of the first generation of the neoconservative movement—including the likes of Richard Perle, Jeane Kirkpatrick, Elliott Abrams, Kenneth Adelman, and Max Kampelman—were occupying top foreign-policy positions in the administration. For Israel’s ruling Likud Party, the policies of the Republican Party seemed to offer the country time to consolidate its hold on the West Bank and Gaza as it encouraged a receptive Washington to view the Arab-Israeli conflict through a Cold War lens. Netanyahu’s UN speeches echoed the Likud-neocon line of that time: the PLO was a Soviet-controlled terrorist organization, Israel was America’s “strategic asset” in the Middle East, and the U.S.-Israeli alliance was containing the international terrorist threat advanced by Moscow and its Palestinian and other Arab allies. The two countries were finding themselves increasingly isolated on the international stage. At times, it was difficult to figure out, after listening to UN Ambassadors Kirkpatrick and Netanyahu speak, who represented the United States and who Israel. But President George H.W. Bush and his realist advisers didn’t buy the spin and confronted the Likud government over the issue of settlements in the West Bank. This approach both antagonized the neocons and weakened the Likud Party, which lost parliamentary elections in 1992 to the Labor Party and its leader, Yitzchak Rabin. Netanyahu, a strident opponent of the Oslo Process, played a major role in mobilizing Israeli opinion against Rabin, whom Likud propaganda likened to Hitler, helping foment an extremely polarized political context in the country. Shortly after Rabin was assassinated by an Israeli-Jewish terrorist in 1995, Netanyahu was elected to his first term as prime minister. The paper, which received input from several additional U.S. neocons like Douglas Feith and David Wurmser, proposed that by waging wars against Iraq, Syria, and Lebanon, Israel and the United States could better ensure Israeli security. President Bill Clinton didn’t sign on, but his successor, George W. Bush, did. Ideas like those promoted in the paper figured highly in the decision to invade Iraq. IN 2009, NETANYAHU RAN FOR A SECOND TERM as prime minister on a platform of burying the corpse of the peace process and expanding Jewish settlements. Bibi’s winning coalition included members of the nationalist and ultra-orthodox fringe of Israeli politics. However, the coalition was not complete—Netanyahu and his neocon friends had counted on the election of their political ally, Sen. John McCain, as well as the possible selection of Sen. Joseph Lieberman as vice president (or secretary of state). Instead of the Mac-Bibi dream team, the U.S. elections presented the Likud-neocon faction with their worst nightmare—a president who was calling for negotiations with Iran and Syria, reiterating his commitment to revive the Israeli-Palestinian peace process, and appointing Mideast advisers like George Mitchell who were not beholden to Israel (while relegating those who were, like Dennis Ross, to less influential posts). On June 4, 2009, President Obama stated during a much anticipated speech in Cairo that the “United States does not accept the legitimacy of continued Israeli settlements.” Ten day later, Netanyahu gave a speech at Bar-Ilan University in which he endorsed, for the first time, a “demilitarized Palestinian state,” but only under the condition that Jerusalem remain the united capital of Israel, the Palestinians have no army, and they give up their demand for a right of return. He also stated that Israel had the right to continue with “natural growth” in the existing Jewish settlements in the West Bank. The dispute over the settlements, however, did not reach a crisis point until Vice President Biden’s visit to Israel in early March, when the Israeli government made an ill-timed announcement about the construction in Seikh Jarrah. Thus was ignited the most dramatic crisis in U.S.-Israeli relations since 1991, when President George H. W. Bush threatened to punish Israel unless it stopped settlement expansion in the occupied territories. In addition to being an Israeli diplomatic slap, the announcement jeopardized U.S. plans for “proximity” talks between Israel and the Palestinian Authority. Obama and his aides decided that unless they responded with a tough message, Washington could end up losing its credibility—or what’s left of it—in the Arab world. It is doubtful that current tensions between the two countries will lead to a long-term divorce. Support for Israel in Congress remains strong, and Obama and the Democrats have a huge stake in maintaining the commitment of Jewish voters. However, it is clear that Bibi—a.k.a. Congressman Netanyahu (R-Israel)—will have to reassess his failed strategy of counting on U.S. rightwing allies to counterbalance the pressure from the president. Otherwise, Israeli voters may decide to replace their “representative” to Washington with a more centrist figure.
. See Akiva Eldar, “What Netanyahu Wants from Obama's 'Self-Hating Jews,'” Haaretz, July 20, 2009, http://www.haaretz.com/hasen/spages/1101415.html. Netanyahu has denied the report.